Welcome to the future of tour technology! SAN JUAN, August 18th, 2009. EyeTour has become one of the first developers in the world to provide an Augmented Reality tour experience for users of advanced mobile phones. Augmented Reality is one of the most exciting technological developments that is rapidly gaining acceptance through the use of advanced mobile phones like the Google’s G1 and the iPhone, and innovative applications such as the recently released Layar Reality Browser by Amsterdam-based company Layar. Following the release of the Layar Reality Browser in June 2009 and it subsequent API release in July 8th, 2009, EyeTour became one of fifty developers in the world entrusted with developing content or ‘layers’ to be browsed using the novel application. EyeTour’s award-winning content, which includes high-quality video tours of Puerto Rico’s greatest attractions, photo galleries, and site information, is available now as an Augmented Reality experience for owners of advanced mobile phones running on Google’s Android platform, like the G1 phone available locally through T-mobile. Users need to download the Layar Reality Browser application to their phones in order to experience Puerto Rico through technology akin to that previously found only within the realm of science fiction. The concept is easy to understand through personal experience and extremely intuitive, but decidely harder to demonstrate through still images or words (which is precisely why we prepared a video demonstration – see Youtube video above). Advanced mobile phones such as the G1 or ‘Google Phone’ are capable of overlaying information on top of the real world by using the device’s camera, GPS, and compass. When you point your phone’s camera towards a target (as you would to take a photograph with it), you’ll be able to see additional information displayed on top of whatever you are looking at on the device’s screen. EyeTour’s Layar contribution allows users to walk the streets of San Juan, finding their way from historical site to historical site via radar, while being able to access high-quality videos, photo galleries, and additional information such as contact phone numbers and hours of operation. The project is the latest in EyeTour’s string of technological innovations within the tourism industry and is part of the company’s commitment to establishing Puerto Rico as a leading destination for tech-savvy tourists, as well as to promoting local development efforts. EyeTour’s Augmented Reality experience was developed in conjunction with Puerto Rican developer Pablo López – known locally for the hit iPhone application, Parranda – who also developed the current version of EyeTour.com, recipient of this year’s SME WebAd Award for Best Website. Mr. López’s new tech company, based in Puerto Rico, focuses on the development of next generation mobile applications and services. A Selection of 8 Layar Dreams – concept designs selected for the Layar Blog. EyeTour is second from top. 8 Layar 2.0 Videos – examples of layers developed for Layar 2.0 launch (August 17th, 2009). EyeTour is second from bottom. AMSTERDAM, August 17th 2009. Layar, which was first launched in June 2009 in The Netherlands, announces that it’s second generation Reality Browser is now available globally on Android devices. Many new content layers are available in the Reality Browser which vary from Wikipedia, Twitter and Brightkite to local services like Yelp, Trulia, store locator’s, nearby bus stops, mobile coupons, Mazda dealers and tourist, nature and cultural guides. To discover new content quickly and with ease, the new Reality Browser includes sections for ‘Featured’ and ‘Popular’. All layers are also accessible via a keyword search in the search function. Layers that are used often can be saved to ‘Favorites’. In addition to the enhanced augmented reality camera view, it is now possible to select Map or List view. For every Point of Interest (POI), several actions can be taken such as: linking to a mobile site for more information, playing a live location based trivia game, linking to a video or sound clip, clicking to call for reservations, and looking at a route description to the POI. Content partners can fully customize their layer to provide a distinctive experience for the user. Over 100 developers worldwide have been given access to the Layar platform by means of an API key, and are currently developing layers. “With the Layar API and support of the developers community, creating layers has been a pleasure”. “We strongly believe that Layar represents the next evolution for mobile applications and feel privileged to participate”. To further grow the community of developers, Layar has released an additional 500 new API keys. The supporting wiki (http://layar.pbworks.com), with developer instructions and documentation, are all now available. Starting from today, Layar is available for everyone with an Android phone anywhere in the world. The Reality Browser can be downloaded in all local Android Markets and is pre-installed on the new Samsung Galaxy (i7500) in the Netherlands. The Layar Reality Browser displays real time digital information on top of reality in the camera screen of the mobile phone. While looking through the phone’s camera lens, a user can see houses for sale, popular bars and shops, tourist information of the area, play a live game, etcetera. Layar first launched on June 16th, 2009 and announced the opening up its platform by means of an API on July 8th, 2009. The Layar platform serves as an enabler for mobile location services – any database with geo-location information can easily be turned in a content layer. The Layar Reality Browser is globally available for mobile phones running the Android operating system. Layar is a company based in Amsterdam, The Netherlands. EyeTour Ready for Official iPhone Debut in Puerto Rico! The iPhone finally arrives at our shores on October 17th, 2008 – a week from today! Puerto Ricans have been anxious to get their hands on the highly coveted phone for more than a year now, and EyeTour will be one of the firsts in line to get a couple of Apple’s iPhones. EyeTour’s Company Vision states our commitment to technological innovation within the Tourism Industry. The company was founded on the promise of developing easy-to-use tools that anticipate the needs of our visitors, tourists, and fellow Puerto Ricans – and in keeping with that promise, we are proud to announce the release of EyeTour’s first Web Application developed specifically for the iPhone. What is EyeTour’s Web Application for iPhone? EyeTour has developed a mobile version of its Old San Juan Video Guide – including 40 of the historic city’s attractions – specifically for the iPhone and iPod touch. 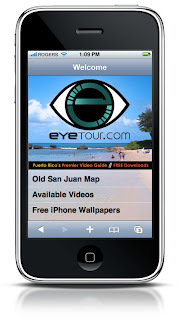 By visiting www.eyetour.com from your iPhone or iPod touch, users will be able to view the entire Old San Juan EyeTour on their phones without having to register or download anything. Videos can be viewed by using the interactive OLD SAN JUAN MAP – just tap the screen on your desired destination! You can also move the map around with a quick flick of your finger or pinch the screen to zoom in and out. Videos are also easily accessed from the AVAILABLE VIDEOS list option on the application’s home menu. Limited Time – FREE IPHONE WALLPAPERS! As a bonus gift to our visitors and as a way of celebrating Puerto Rico’s Official Oct.17 iPhone Launch, EyeTour has designed 16 Free iPhone Wallpapers for users to download directly to their iPhones and decorate their equipment with some of the island’s most amazing sights! Visit www.eyetour.com from your iPhone or iPod touch and select FREE IPHONE WALLPAPERS from the menu, then choose your desired wallpaper and touch down on the image for 2-3 seconds to save it to your phone. You can change your iPhone’s wallpaper from the Settings icon on your iPhone’s main menu (then touch ‘General’ and finally ‘Wallpaper’).